Latina Lista: News from the Latinx perspective > Palabra Final > Politics > How come the “nation’s largest living generation” doesn’t have a bigger turnout at the polls? How come the “nation’s largest living generation” doesn’t have a bigger turnout at the polls? LatinaLista — A recent NPR headline asked: Why Don’t Bernie Sanders’ Big Rallies Lead To Big Wins? It’s no secret that the vast majority attending Sanders’ rallies have been millennials. His message resonating with this age group has made for a visual odd couple that distracts from the fact that they see themselves as kindred spirits with the octogenarian’s ideology. The millennials flocking to Sanders’ rallies have mostly been college students and older. In other words, they are of voting age, with many first-time voters. So, what’s happening between the rallies and voting day for these millennials? A new study might shed some light. The National Study of Learning, Voting, and Engagement (NSLVE) from Tufts University released a first-of-its-kind study analyzing the 2012 voting behavior of certain groups of college students, based on an analysis of the voting records of 7.4 million students at 783 college and university campuses. Overall, college students in the NSLVE study voted at a rate of 45% in 2012, with those eligible to vote for the first time voting at a lower rate of 40%. Women voted at higher rates than men. Among all racial/ethnic groups, Black students voted at the highest rate (55%). Among Black students, women in the study voted at a rate of 61%, while men voted at 44%, which was similar to the percentage of white men (45%). Only 48% of first-time eligible voters chose to vote in person on Election Day. The remainder voted absentee (29%), early (16%) or by mail (7%), where allowed. Latino first-time student voters voted at a rate of 36% versus the 39% rate of Latino student voters. Will female students, who voted at higher rates than male students, and Black students, who voted at the highest rate of any racial/ethnic group in 2012, maintain a high level of participation in 2016? 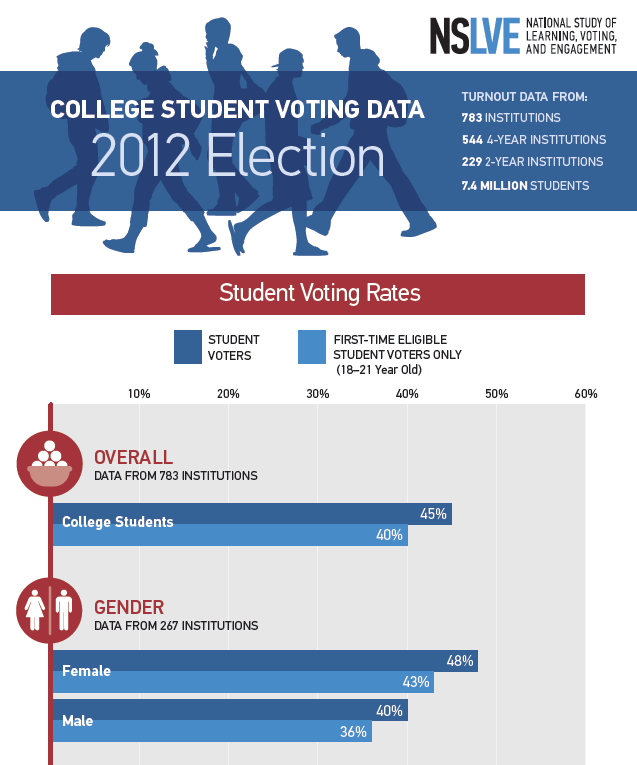 Because many undergraduate students are also first-time voters, college is an important time for students to learn about democratic processes. But first-time voters in this study voted at approximately 40%. What can universities do to support political engagement in the 2016 election?  What issues do students care about and are colleges and universities giving students opportunities to engage with these issues in a relevant way that encourages political learning and voting?